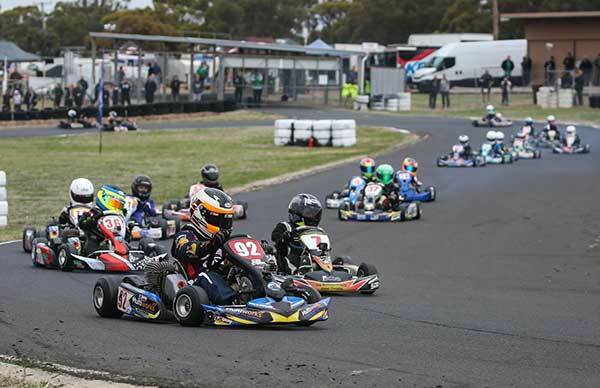 With a large turnout of 216 karters for the 2018 mid-season round, the Horsham paddock was extended into the neighbouring motorcross complex to accommodate the influx. The track was packed full of action and the paddock was packed tight for an exciting weekend of racing. In his first VCS round in the senior restricted class, Alexander Grutteria would take pole by a tenth from a group of regular VCS front runners. Heat 1 would see Alex drop down to 4th on lap 1, while Andrew (#96) and Brock Rae (#19) made hay to maintain 2nd and 3rd. The #21 of Maximmo Torcasio was never headed once in the lead, taking the win by 1 second. Heat 2 was worse for our pole sitter, dropping to the rear of the field on lap 1. Brock Rae was chasing Andrew Rae for 1st position, but would drop out of contention on lap 8 allowing the #94 of Joseph Clough to move through to second. Aaron Neilson (#86) moved forward all race, starting from 7th, and finishing 3rd. Benajmin Bizzari (#10) would flirt with 3rd position twice during the race, but end up 0.6 secs behind 3rd position. After good luck in the heats, Joseph Clough was to slip from 2nd to 5th on lap 2. The leaders however were lapping 0.4 seconds faster and did not want to be re-caught. Todd Chambers made excellent work of the pack, starting from 9th to bring home 3rd. Andrew Rae was trailing Maximmo Torcasio for 9 laps until the move was made to claim 1st position. Max would take 2nd, and Andrew the win. 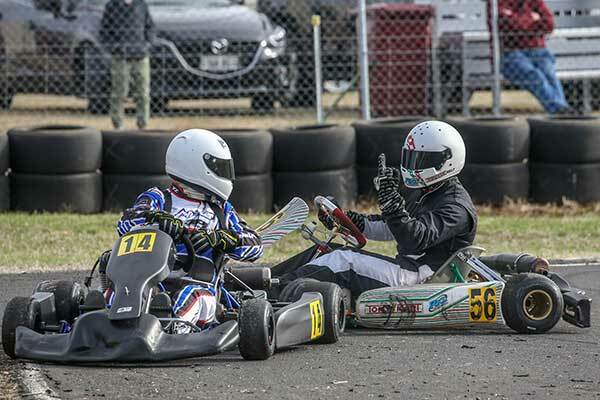 Aaron Jackson (#2) had a great day out in TAG Heavy, claiming pole by 0.02 seconds from Scott King (#4). Three other drivers qualified within 0.1 of a second, making for a very close starting grid. Daniel Richert (#90) and and Glenn Croxford (#97) would trade positions for 3rd place, with Croxford coming out on top. Several drivers were battling to keep tyre graining under control, as the left front is torched by Horsham’s 5 right hand corners. Aaron did not look to be suffering, and was comfortably the quickest kart on track in heat 2, winning by 3.2 seconds from Scott King. King was shadowed all the way by Richert, taking 2ndby 0.1 seconds. The final was a closer affair, but still went Aaron’s way with a victory by 0.8 seconds from King. Richert would finish 3rd, and Croxford 4th. 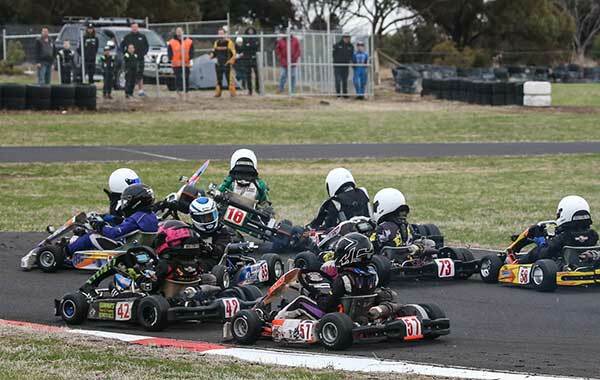 The fastest karts at Horsham were churning out rapid low 23 second laps in qualifying. Connor Farr (#82) would take pole with a 23.164, pipping the #91 of Joshua Denton by just 0.075 seconds. Race 1 would see the same positions maintained, as both drivers crosses the line 0.2 seconds apart. 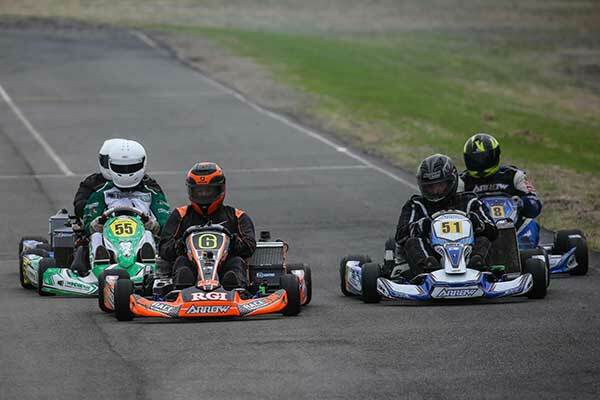 Joshua had to work his way back from 3rd place after losing a position at the start, getting the better of Mark Domaschenz (#90), who would finish 3rd. Farr would suffer some pain in heat 2, falling from the lead to the rear of the field, before climbing back to 11th. Denton would take the win from Domenic Romeo (#12), while Domaschenz would lose 3rd to Harley Benson (#15) on the second last lap. In the final Romeo and Benson found a snake instead of a ladder, and slipped from 1st and 3rd to 6th and 5th on lap 1. Denton, Farr and Domaschenz marched on, with Denton holding the lead until a last lap drama that let Domaschenz and Farr slip past. Domaschenz would take the win from Farr by a handy 0.3 seconds, and Denton would retain 3rd. Jordan Ford (#57) threaded his way nicely through the battles, finishing 4th from 8th on the grid. A very close qualifying session saw just 0.003 of a second separate Hugo Simpson, Ethan Bray and Ryan Bettess. With margins like that Kobi Williams seemed a “distant” 4th, but the gap to 1st was still only 0.029 seconds. Ryan Bettess (#13) would get the jump in heat 1, leaving the #1 of Hugo Simpson to chase for 2nd and finish 0.1 behind the leader. Ethan Bray (#31) had a heat to forget, slipping backwards through the pack to finish 8th. Kobi Williams (#94) and Kai Upiter (#73) were the bets of the rest taking 3rd and 4th place. The start played a big part in the finishing positions for heat 2, jumbling the lead group. Ryan Bettess would stay out in front, while Kobi Williams and Ryan Morgan would leapfrog Hugo Simpson and Kair Upiter for 2nd and 3rd. Hugo would finish in 4th closely followed by the #10 of Oliver McNaught. Ryan Bettess has another smooth run in the final, which was not what was expected from the super close qualifying times of the front runners. Kobi Williams had to work hard for 2nd, falling back to 4th on lap 1 before besting Hugo Simpson and Kai Upiter in on track battles. Kai Upiter was in the running for 2nd for 11 laps before falling to 5th just a few laps from home. Hugo Simpson would win his battle with Ryan Morgan on the last lap to claim the final podium place. Some bad luck in qualifying saw 3 drivers not post a time. The #86 of Rock Han has no such drama, and would claim a convincing pole with a 26.786 second lap time. Rusty Ponting (#21) and Jensen Marold (#31) both started from the back of the grid because of a qualifying issue, and they both made their way forward in style. Rusty would be in 2nd place by lap 9, and Jensen would be in 4th place by lap 11. Rock Han would take the win from Rusty and the flying P Plater of Lochlan Farrell (#33). Rock would hold station in heat 2, finished 0.3 ahead of Rusty the Rocket. Lochlan Farrell would again pick up 3rd while Marold was demoted to 4th. The final saw Rock take the victory from Ponting, with Jensen Marold would finish 3rd and claim fastest lap with a 26.639. Lochlan The Flying P Plater’s fortunes did not continue in the final, suffering a DNS after running as high as 3rd. Ron Taylor and Leon Forrest decided to set identical times of 24.951, but Phil Smith decided to better them both and post a time of 24.931. Ian Branson was also in the mix, just 0.052 behind pole position. Phil Smith (#4) was out in front until lap 7, but a hard charging Ian Branson (#66) was on his tail gaining rapidly. Branson would take the lead and move off to a 1.7 second victory. Ron Taylor (#92) would beat Leon Forrest (#11) home to 3rd. Smith went backwards in heat 2, dropping to 6th after starting from pole. Branson capitalised to take the win, and Ron Taylor took 2nd. Andrew Stubbs (#55) kept a clean nose to grab 3rd, followed by Matthew Crane (#97) who made his way up the field from 8th. Phil Smith came out on top in the final, assuming the lead on lap 1 and maintaining it until the flag. But a penalty would mean his win was not awarded, and Ron Taylor would be the beneficiary of 1stplace. Branson would claim 2nd, with Leon Forrest 3rd. A smallish field of heavies would be led to the grid by the #6 of Brett Jenkin. Jenkin would fend off Andrew Harvey (#51) in heat 1, taking the win by 0.16 seconds. Race 2 was an almost identical margin between Jenkin and Harvey at the flag, followed by the #55 of Cameron Austen in 3rd.. Andrew Harvey would give his all, with a second best lap time in the final, but he would be beaten to the flag by the faultless Jenkin. Peter Sloan (#23) managed to grab the final podium position from Cameron Austen on the last lap of the Wimmera bull ring. 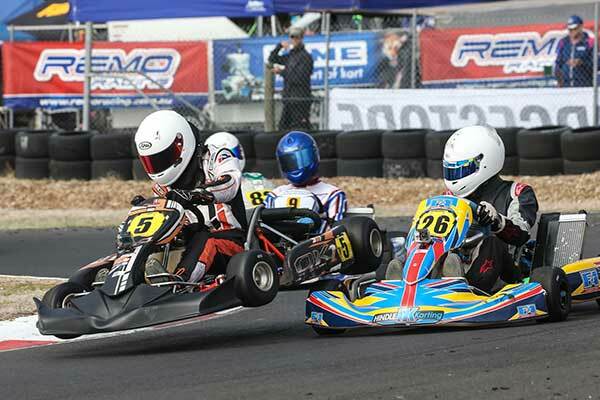 There are some very good drivers trying, but its very hard to get on top of the #2 Billy Westerveld kart. Beau Humphrey (#28) , Ash Mitchell (#5) and Alex Baker (#19) would all be less than 1 tenth away from pole, but the Westerveld machine would take it with a 24.790. Westerveld and Humphrey had the pace in heat 1, finishing a clear 1st and 2nd a little ahead of Ash Mitchell in 3rd. Kade Gibson (#20) was the best of the remaining pack, finishing 4th 4 seconds back. Beau Humphrey made the decisive move at the heat 2 start, taking the lead into the first corner and holding off Westerveld to the flag. The #19 of Alex Baker would fight back from a rough heat 1 to claim 3rd place 0.2 seconds ahead of Ash Mitchell. Kade Gibson (#20) would pip Jake Gibson (#21) to the flag for 5thposition, crossing the line 0.2 seconds ahead. Westerveld made amends in the final, getting the jump at the start and forcing Humphrey to play follow the leader. Ash Mitchell capitalised on some home track knowledge, bring home a strong 3rd position, ahead of Alex Baker and Kade Gibson. Jobe Stewart (#30) would take the pole position crown as a sign of speed to come in the final. 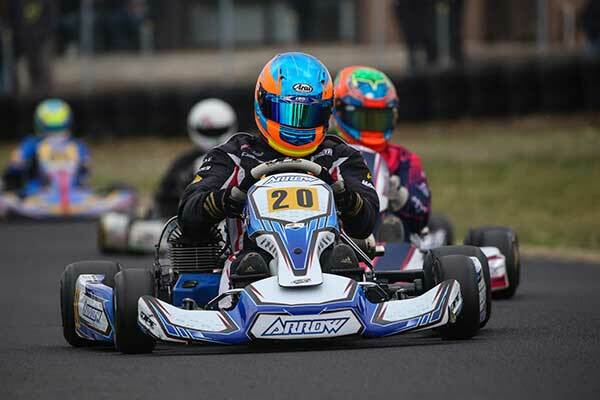 KA4 Junior Light has been one of the most entertaining classes of 2018, with great battles throughout the field. Heat 1 would see the #15 of Christian Cowie shadowed to the line by Stewart, with Nicholas Sacco (#80) in 3rd. Hugo Simpson would drop out of 3rd place and recover to 10th from the rear of the field. Race 2 would see a great dice for the lead between Cowie and Stewart, before a late drama that saw Sacco jump both of them to 1st. Cowie would recover to 2nd, but Stewart was down to 4th after getting picked off by Nerinda Beard in the aftermath. Cooper Johnstone (#67) and Hugo Simpson (#7) following closely behind in 5th and 6th. Cowie would start the final from pole, but was picked off by Stewart on Lap 5 , then Sacco and Cooper Johnstone on lap 11. A fighting finish would wrestle the final podium position from Johnstone back to Cowie. Jobe made ground early to move up to 2nd, before taking the race lead from Sacco that he would not relinquish. The midfield battle was intense, with many changes of position between Beard, Simpson and Jaxon Johnstone. #31 Jaxson Cox was the polesitter in KA3 Senior Light, with a time of 24.026. Nicholas Trebilcock (#86) and Nathan Williams (#95) were “oh so close” with gaps of 0.025 and 0.035 respectively. Jaxson would be the clear winner in heat 1, staying out of trouble in the lead while Trebilock was dumped to the rear of the field from 2nd. Bryce Woollard made the most of the start to from 7th to 3rd, but Corey Herbetson would take that spot from him late in the race. Cox displayed a clean set of heels again in race 2, while Corey Herbertson continued to move forward taking 2nd place. Nathan Williams would finish 3rd, with a gap before the #64 of Joel McPherson. Was anyone going to stop Remo Luciani on home turf? Chris Thomas (#7) was up fight, laying down the gauntlet with a 24.38 second pole lap. Luciani qualified in p2, with the #13 of Aaron Jackson just 0.075 behind. The final was the same result for the top 3, with Luciani taking the win by 0.2 seconds from Thomas. Mitchell Branson would take 4th chasing the tail of Aaron Jackson in 3rd. Another huge turnout of Cadet 12s saw the class split using the A v B v C system. Matthew Domaschenz (#92) would take pole, but only by 0.065 from Sam Whiteford (#15), Thomas Schmidt (#36) and Fraser Carr (#76). Race 1 would see groups A and C, and 3 of front runners were Matthew Domaschenz, Thomas Schmidt and Fraser Carr would go to battle. Domaschenz took the lead from lap 1, and would be closed followed home by Thomas Schmidt in 2nd. Fraser Carr was in 2nd until a DNF on lap 4. James Lodge (#39) was the mover of the heat, moving from 7th to 3rd. His big move was matched James Ceveri (#21), who climbed all the way from 12th to 5th. Parker Scott (#23) would stay clean to finish 4th. Race 2 involved groups B v C. Sam Whiteford (#15) would lead early on, before Thomas Schmidt took the lead on lap 6. Brocklan Parker (#7) cruised from 4th to 2nd, while behind him regular front runner Jesse Lacey plunged from 5th to the rear of the field. He would make his way back to 14th in a field of 22. Race 3 involved groups A v B. Domaschenz took off into the sunset and was never troubled for the win. Whiteford and Carr would battle for positions 2 and 3, with Carr being the eventual victor. Brocklan Parker battle with Tyce Hodge (#85) for 4th. Lacey would go backwards again, but not by as much as race 2 and he would finish 7th from 5th on the grid. 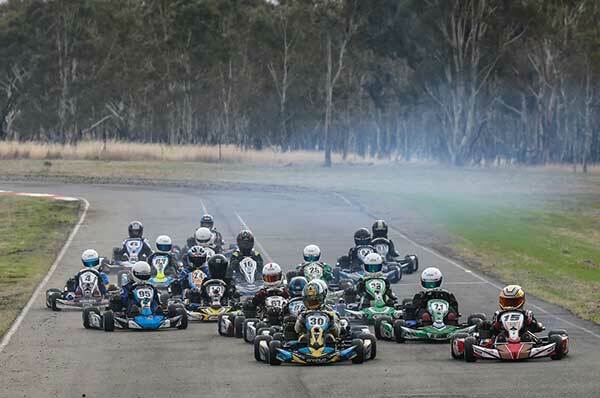 The big Cadet field was set for a showdown, and the final got underway in the last of the dry conditions for the day. The Cadets took to the track on slick tyres, and the drizzle set in on lap 2. Matthew Domaschenz took it all in his stride, riding out the slippery laps before returning to semi-normal lap times by the end of the race. 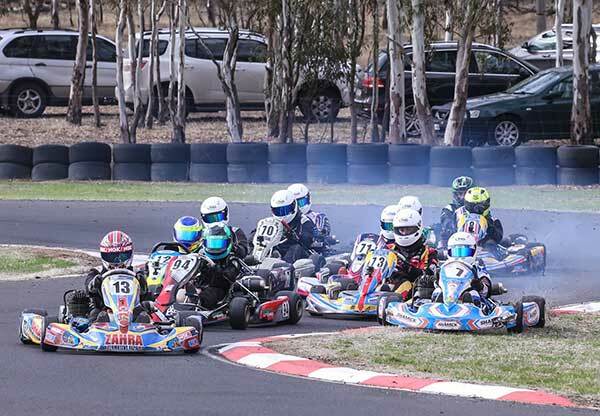 VCS photographer Ben Roehlen found himself in the wrong place at the wrong time when some karters on slick tyres started to push harder. Jessie Lacey’s kart understeered straight off the circuit, knocking down the tyres that Ben was standing behind, and knocking him off his feet. As a result a red flag ended the race prematurely, and fortunately Ben was ok.
Brocklan Parker (#7) and Thomas Schmidt (#36) demonstrated their prowess in the conditions, crossing the line 2nd and 3rd. Schmidt would suffer a post race penalty, awarding the 3rd position to Isaac Woodhouse. The #5 of Joel Johnson was the pacesetter for KA4 Junior Heavy. Heat 1 would see the #28 of Zaiden Barry climb to 1st position before an incident on lap 5 sent him to the rear of the field. Johnson would take back his 1st place position for the win, followed by Aiden Solomon (#33) and Kyle Belton (#29). Heat 2 also went to Johnson, but it was the #95 of Daniel Hookway moving up the grid to take 2nd from 5th on the grid. Zaiden would begin his fightback , finishing 7th from 17th on the grid. The start of the final would cost Johnson and Solomon dearly, both being relegated to the rear of the field. 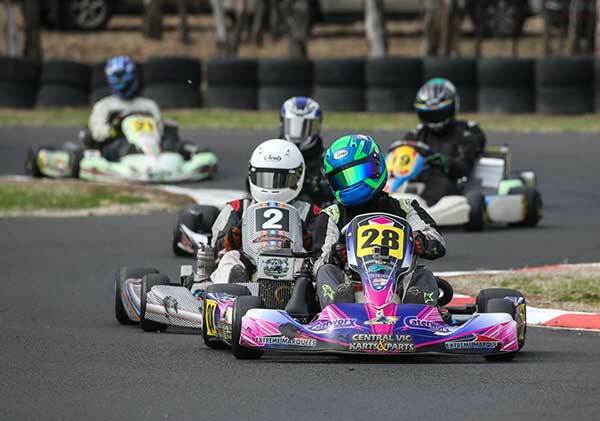 Daniel Hookway would make hay and take 1st position, while Zaiden Barry moved in to 2nd position from 8th. Keean Ferguson (#48) would claim the final podium position. Each winner picked up some Rock Oil chain lube and a choice of synthetic or castor oil to keep their kart roaring along. 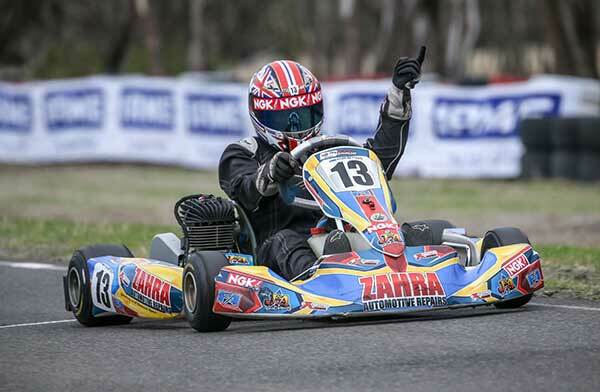 Thanks to DPE Kart Superstores and MGtires.